This entry was posted in SAP by Matt Bartlett. Bookmark the permalink. 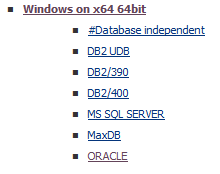 We have already connected to external SQL Server using DBCON. However, we were looking for connecting to external Oracle Database through our SAP which is on SQL. Your document proved to be a exact guide to us. Your document proved to be an exact guide to us.